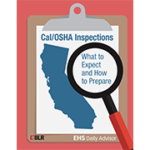 Whatever the reason, if Cal/OSHA on your doorstep, you can’t send the inspector away—not for long or without a very good reason— but you can be prepared for a Cal/OSHA visit. You can even take some steps to reduce your risk of being inspected. This Special Report will show you how.